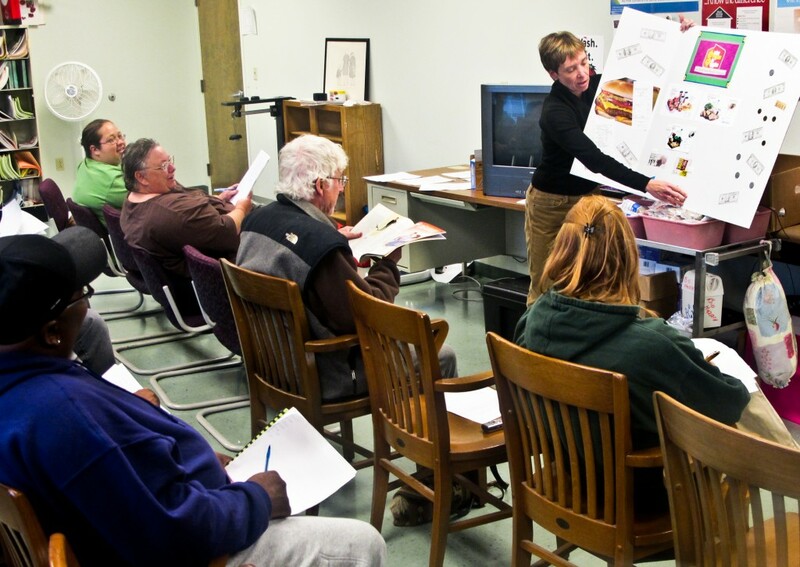 Karin Kozlowski, WVU Extension Nutrition Outreach Instructor, helped design a month-long course at a food pantry, teaching people how to cook fresh food on a shoestring budget. Photo courtesy Jefferson Community Ministries. Is it possible to eat healthy, tasty food on a shoestring budget? Karin Kozlowski says yes. “It takes planning, but you can cook for less than you’d pay for fast food,” she said. Karin is a WVU Extension nutrition outreach instructor in the Eastern Panhandle. She teaches a multi-week low-cost, healthy cooking class for the Jefferson Community Ministry food pantry on cooking on a SNAP budget, using vegetables from the pantry’s community garden. She combines small amounts of higher-cost ingredients (meat, some vegetables) with lower-cost ingredients (rice, beans, other vegetables) for stews, stir-frys, and casseroles with tasty ingredients like herbs, garlic, lemon juice and hot sauce. demonstrations at the Morgantown farmers market, showing people how to stir-fry and make stews, mixing small pieces of meat with fresh vegetables and grain. Seeing how popular her demonstrations were, the Morgantown farmers market set up a permanent cooking station. How about healthy cooking classes in your community? Click here for a great list of Web sites on cooking on a shoestring budget! These sites will help you create classes on low-cost healthy cooking …. or help you cook healthy food yourself. The national Cooking Matters organization offers first-rate, affordable resources for communities that want to organize cooking schools or demonstrations. Contact WVU Extension Service Nutrition Outreach Instructors. Help them schedule cooking demonstrations in venues such as the farmers market, school health classes, or evening classes (see below). It’s their job. If your county doesn’t have an instructor, find out which instructor covers your county. Family Cook Productions: This Web site has it all: blueprints for community and school cooking classes, tips for teaching kids to cook healthy food at home, etc. etc. Kids Rock Nutrition in the Kitchen. A great collection of video recipes, cookbooks, and other resources for kids. Body Works: Twice a year in Martinsburg, a coalition of groups offers this eight-week cooking course for parents and teenagers, free from the Office on Womens Health. The course helps mothers learn cooking skills and ways to create a home environment that fosters healthier habits. The US Department of Agriculture has a first-class collection of resources, curriculum, recipes and lesson plans for adults and kids. Want affordable, tasty alternatives to soda pop? Water is a good start. Also try tasty fruit-infused water recipes and others at Pinterest. See the Try This page on gardening in schools for ideas about combining gardening and cooking. Classes at a medical clinic. 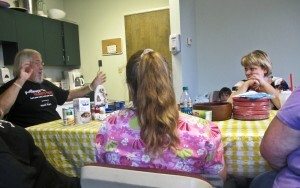 In Charleston, West Virginia Health Right, a free clinic, offers popular healthy cooking classes. 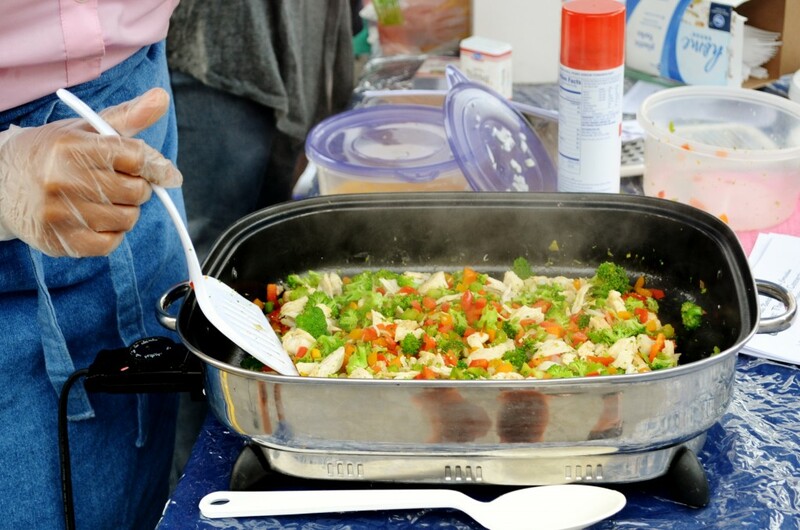 Volunteers give one-time cooking demonstrations, hand out recipes and lead lively discussions. People give each other tips. A community kitchen. 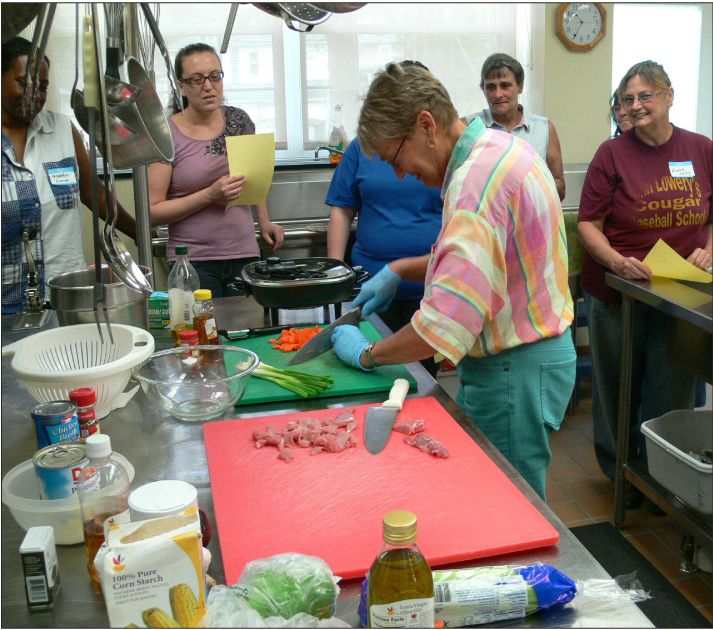 Healthy cooking classes are offered regularly at Huntington’s Kitchen, a community kitchen. Catholic Charities sponsors the WellnessWorks program which offers nutrition coaching, medical screening and a monthly newsletter. Demos at libraries: See photo this page. Dining with Diabetes – WVU Extension offers this diabetic cooking class in various counties. 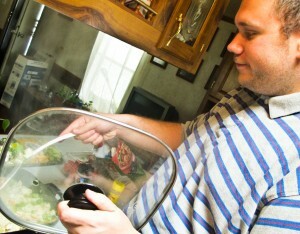 Check with your agent. .
Want to build a broad, more sustained effort to spread cooking skills? Join your local school Wellness Council. That gives you an official way to campaign for cooking classes. 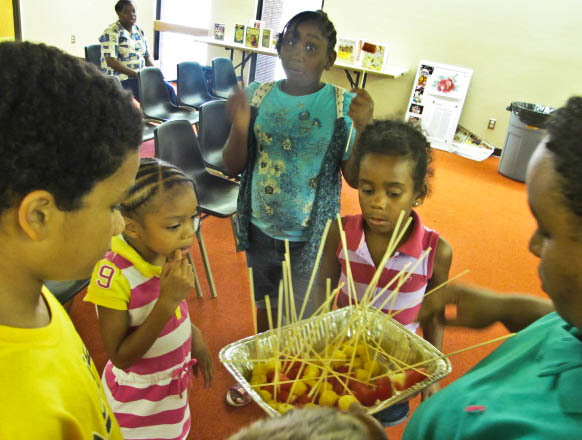 How can your school system teach nutritious cooking? Maybe in health class, maybe collaborating with Extension. The resources above can help. 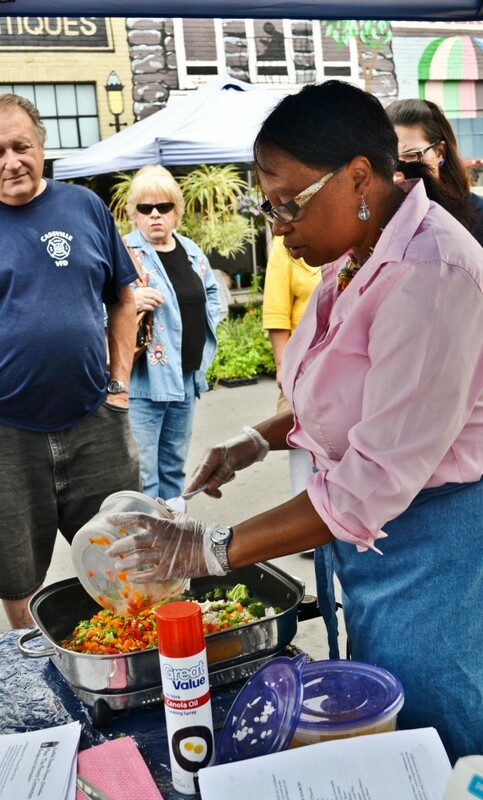 “If you stir fry, you can make a piece of meat go a long way,” said Nutrition Outreach Instructor Belinda Nicholas, here demonstrating low-cost cooking at the Morgantown Farmers Market. Involve your local media. Ask if they’d run a series of low-cost, healthy recipes with a column that helps people learn how to cook healthy food on a shoestring budget and make food ahead. They could draw from the materials in the above Web sites for columns. Involve WVU Extension Service. Extension has nutrition outreach instructors who can help arrange classes and supply materials. I am a community resource coordinator for KVC Behavioral Health. I have been looking to set up a cooking class with out foster children. Is there any guidance or assistance you could give me in securing a class. Thanks in advance for your help! Check out the jumprope page, http://trythiswv.com/get-kids-jumping-rope/. Get in touch with the Modern Woodsmen. The page will tell you how to do that. They supply free jumpropes and “how-to” info. Going to put this articie to good use now.